SoftRide's answer to front suspension is a heavy duty, spring loaded stem. 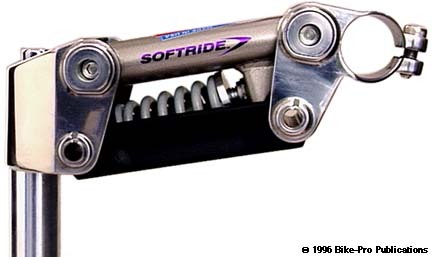 As an alternative to front fork suspension, SoftRide designed, (and Control Tech makes some of aluminum parts for them), a stem that permits the up to 3" of progressive shock absorbing travel up and down. At the time of this re-write March, 1994 the aluminum quill model of this stem was un-available due to a total recall of all the stems so far unsold by SoftRide. The recall, (being referred to as an "upgrade"), centers on the upper beam also called a "dog bone" by SoftRide. 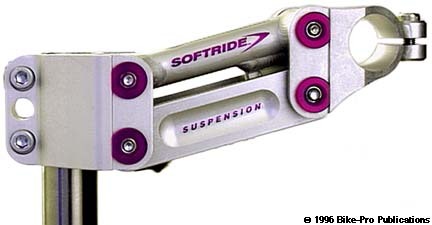 A .06% failure of the part has lead SoftRide to feel obliged to make a new version of the part, and make it available at no charge, to current owners of the stem. The writing that follows was done initally when the stem was released, though there may have been some changes in materials or technique since then, it is generally accurate. Originally called the "Frankenstem", it uses a swiveling parallelogram design that fixes the handlebar to the stem body at four points on each side, with a micro-adjustable spring, and polymer bushing for initial shock absorbtion mounted between the upper and lower beams. The quill is made of aluminum rod that's turned to the precise dimension of the steerer tube, then bored from the top and bottom, with an 8mm hole joining them to make a single quill for the stem. 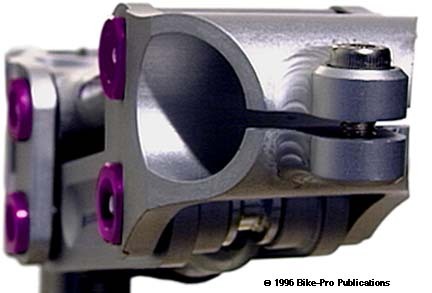 The upward bore is nearly 6" deep to reduce the length of the expander bolt, and the overall weight of the stem. The quill is pressed and bonded to the stem body, which is machined from billet aluminum. The body is made with two arms, 48mm tall. Each of the arms has two holes drilled through it, for a thrust bearing that passes into the upper and lower pivoting beams. The upper beam is made of an oval aluminum extrusion that has a machined aluminum rod TIG welded perpendicular at both ends. The rod is drilled though to receive the dimension of the thrust bearing and allow a steel bolt to pass clear through the assembly. All four of the right side thrust bearings are broached with a hex shape that will hold a steel nut. A steel lock nut fits snugly into each hex shape, which will recieve a steel bolt that passes through the upper or lower beam assembly. The left side thrust bearings, beisdes securing the beam assembly are also bored to fit the diameter of the bolt head. The bolts are removable to replace worn bearings. The replacement of any of the eight bearings can be done, in the field, by any crafty rider using a 4mm hex wrench. The lower beam is made of machined aluminum bar stock, with a decorative flute running it's exposed length. The lower beam, like the upper beam, is fastened to the body by the thrust bearings which pass through the arms and into the beam. The handle bar binder is made of extruded aluminum that is turned on a lathe to cut away the excess aluminum leaving arms similar to those on the quill side for the beams to fasten into. The binder arms are drilled like the body arms to receive the same thrust bearings, positioned the same way. The binder is fastened to the beams using the same hex head bolts, from the left side, anchoring into locknuts held in place in broached thrust bearing fittings on the right side. On the bottom of the upper beam, a thick machined aluminum plate is welded, that has a urethane bumper resting against the front of the lower beam bolt assembly. The urethane bumper provides a supported, slippery surface as the stem pivots up and down. The bottom of the welded piece has threads tapped for a 3mm allen cap screw. The cap screw is fastened to a turned aluminum piece that resembles the quill cap piece on many other stems. The turned aluminum piece is an adjustable length shoulder for the spring. The spring, (which in early models was the same type used by the military to check the re-coil in 50 caliber machine guns), sits on the urethane bumper at the rear and under this adjustable compression shoulder at the front. A 3mm hex wrench is all you need to adjust the spring compression to your type of ride. The binder fittings are machined from aluminum rod, TIG welded to the front of the binder, then the assembly is sawn across the front to make the cinch system. The lower binder fitting has a steel nutsert pressed in so the steel binder bolt won't strip what would be frail aluminum threads. The binder bolt has 6mm x 1mm thread pitch, is 16mm long has a 5mm hex head and weighs 5.5 grams. Because of the parallelogram design in the beam structure, the handlebars are held in constant pitch relative to the rider's arms and hands. There is no pivoting or twisting at the handlebar or the grips even at the maximum 3" suspension travel. The SoftRide Aluminum stem is available tp fit 1", 1 1/8" or 1 1/4" diameter headsets, though the quill is only made in the 1" and the 1 1/4" size. Stem shims, sold separately, are used to build out the diameter of the 1" model to become the 1 1/8" or 1 1/4" diameter. It is available in two extension lengths 135mm, or 150mm lengths, with their rise at approximately 10 degrees. The present weight of the SoftRide Aluminum due to the recall is unknown. This is a high efficiency way to reduce fatigue due to high frequency road and terrain oscillations. Silver with Lavender accents. SoftRide make an adpatation of their aluminum stem for use with the Aheadset, threadless forks. The rear body and arm structure is made using an extrusion cut to a 49mm length which will become height once drilled for the beam bearing assemblies, thus making the vertical clamping tube for the steerer. Rather than milling away a 19mm thick rear-most spine that protrudes 14.5 mm, it is bored from both sides to recess a stainless steel nutsert on the left and cradle a binder bolt head that will used as a clamping bolt on this vertical clamp on the right. Each of the clamp bolts is spaced 10mm from the top or bottom. The same 6mm x 1mm bolts are used for the clamping and handlebar binding. In all other mechanical respects, the Ahead is the same as the Aluminum. The Ahead is made only in the 1" or 1 1/8", in just two lengths, 135mm or 150mm. Silver with Lavender accents, the 1" diameter in a 135mm length weighs 514 grams. SoftRide produces a less expensive version of their suspension stem, using steel rather than aluminum parts to reduce the cost, though in principle everything works the same. The front piece which holds the handlebar and the rear piece which supports the beams and houses the quill are made of stainless steel in Taiwan by Everest Industrial. The other pieces for this stem are all said to be made in the United States, with the final assembly done in the United States. The upper beam (dog bone) assembly is made of TIG welded cro-moly steel, and painted a metallic Silver. The aluminum lower beam pieces have been replaced with Black composite plastic pieces. The quill tube is made of machined aluminum rod, with a 3mm wall thickness. The quill tube is bonded to the interior of the rear steel beam supporting structure. The wedge is similarly machined of aluminum rod. 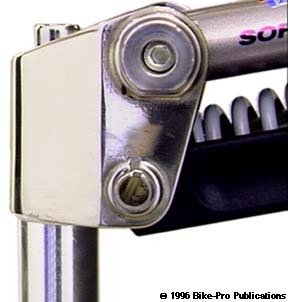 The primary mechanical differences between the two stems appear to be the lack of bearings at all four lower pivot points. Instead of using the bolts and bearings at the lower beam contact points they are fastened using a steel tube that is peened at both ends. The four upper pivot points use the bearing within the aluminum bushing that is used in the aluminum model. The bearings are held in place with a steel bolt anchored by a lock nut, as in the Aluminum model. The expander bolt is made of chromed steel, in Taiwan, having 8mm x 1.25 threads with a 135mm length, a 6mm hex fitting and a 48.5 gram weight. The SoftRide Cro-moly Suspension Stem comes in three lengths, 140mm, 150mm, or 160mm in just the 1" diameter. 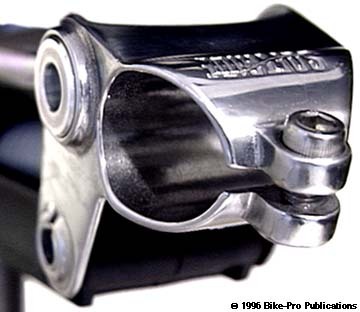 Like the aluminum model of the stem, a stem shim is required for use with a 1 1/8" or 1 1/4" headset. The weight of the 140mm long Cro-moly SoftRide suspension stem is 635 grams.